Today is Steph’s birthday and I thought I’d come out of the woodwork to say happy birthday to my beautiful wife. Every year on her birthday, I’m always super happy and hopeful that she is now old enough to visit liquor stores and not immediately asked for the ID she usually doesn’t have with her. Every year though, she’ll inevitably be asked to wait outside while I buy. Steph harbors a deep dark secret about birthday cakes: she desperately wants everyone she knows to buy or make her a cake on her birthday so she can eat all the cakes all at once, except that she really doesn’t because it would make her fat. Each year, she’s disappointed that somehow, everyone seems to coordinate and only one cake ever shows up. It’s very sad in her world and I’m the one who is stuck telling her that no one can know to buy her multiple cakes unless she tells the world her dark secret, which she won’t. On the other hand, my dark secret is that I’m a terrible husband and I’ve never gotten her a proper birthday cake. My history with Steph’s birthday cakes is pretty hit or miss. The first year we hung out, she didn’t have a car so she asked me to take her to this famous old Italian bakery on the most hipster street in town, where she picked up a birthday cake for her own birthday party (remember, no one knew her dark secret, until now). At that point, I wasn’t cool enough to be invited to her party, so I dropped her off and went on with my business. It was cool though, I acted chill and invited her, after the party, to probably the worst birthday dinner picnic ever conceived. I bought rotisserie chicken and potato salad from a nearby grocery store, she brought a candelabra and tablecloth, and I knew of this amazing picnic spot up on a mountain overlooking the city with only one picnic table. The plan was perfect, until I realized that we both got off work after dark and Steph is incredibly, massively paranoid when its dark. As we were setting up she heard a rustling noise and was unshakeably certain that there was a serial killer hiding in the woods. At first I thought it was a joke, then realizing she was serious, I tried to tell her it was probably just the wind or a deer, but she was unconvinced. That night, we ended up eating rotisserie chicken in the car, and we haven’t been back to that spot since. Year one, no cake. The next year we were officially together, and being the only person who knew her dark secret, I planned on a cake. We had flown to New York for a birthday trip. For work and cheapness reasons, we were supposed to fly home on the day of her birthday. I thought I’d have plenty of time to buy a cake on the way home from the airport. We were young, poor, and to be completely honest, not that bright, so we were scheduled to fly home out of Newark (huge mistake) and our flight ended up cancelled due to weather (Newark, I later found out, lead the nation in cancellations that year). Being stuck in NYC isn’t the worst thing in the world though, and we made the best of it. I bought her a birthday Pinkberry back when Pinkberry was a new and novel thing and we ended up having dinner that night at Momofuku, where a star was born (and I don’t mean David Chang), but, year two, no cake. Year after year, it goes on like that. A couple of years ago I tried to throw her a surprise party. The cover story was to spend her birthday just the two of us at a nice restaurant in town. I had help from a couple of friends but found myself again in charge of the cake. I wracked my brain thinking of the many ways to hide a cake in the fridge of a full time blogger. Quickly realizing how misguided that idea was, I gave up and just depended on the fact that Steph thinks I’m an incredibly impulsive person. I told her I randomly bought a cake from her favorite bakery on a whim, but that we had to wait til after we got home from dinner to eat it. What I didn’t count on was her begging all day to have “just a bite”. I couldn’t keep saying no without a good reason though, and in the end totally gave in. We cut a slice and ate it for lunch, and wound up serving a half eaten cake at the party that night. I think the only year I succeeded was the year we went to Paris for her birthday. I bought her a tiny, personal sized montebello and asked her to marry me. She finished her bite of cake first, then said yes. It was in my eyes a total cake success, but sadly, probably my only cake success in all the years we’ve been married. 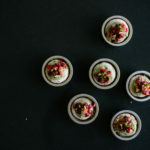 I’m pretty sure that little raspberry-topped pistachio dacquoise is forever enshrined in our memory as “our cake”. This year, I told myself, was going to be different, this year was the year that she got a real cake. We had some close friends invited over for an after dinner all night birthday cake and drinking party. Inspired by my only cake-victory, I planned to bake her the montebello we had so many years ago. I spent most of the day on the cake, chopping pistachios and making more meringue than I had ever made in my life. Once I was done, success was declared and Steph and I treated ourselves to hot pot, which is our guilty pleasure. For those who haven’t experienced the joy of an asian hot pot at home dinner – write in the comments and help me convince Steph to write a blog post about hot pot, because she thinks it’s too simple, but my mind was personally blown when she first made it for me. The hot pot was so good, Steph ate herself into a food coma and we ended up calling the party off. Sigh, another year, no cake. Anyway, happy birthday to the love of my life. 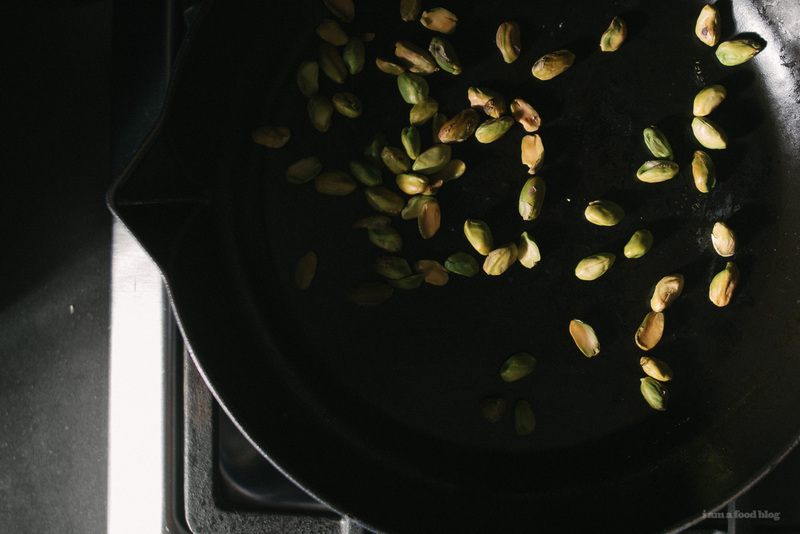 Preheat your oven to 300° F. Shell the pistachios and blanch them in boiling water for a minute or so, then drain. 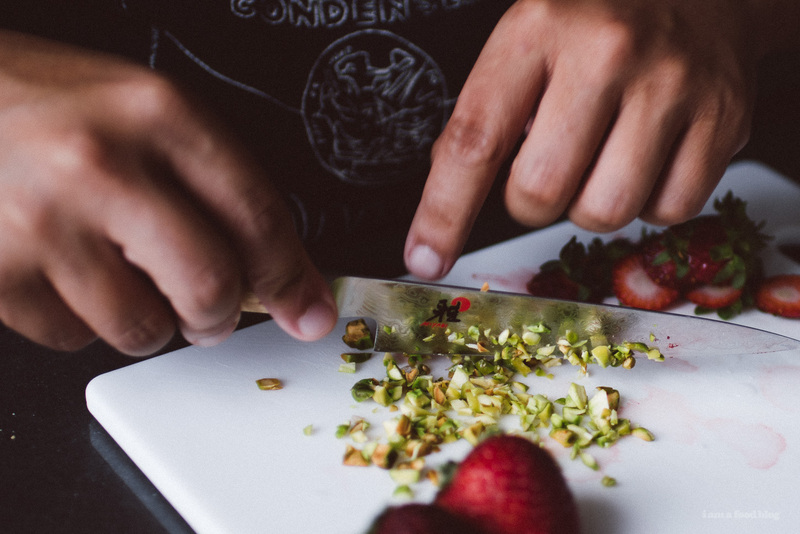 Peel the pistachios and place on a baking sheet. Bake for 10 minutes. 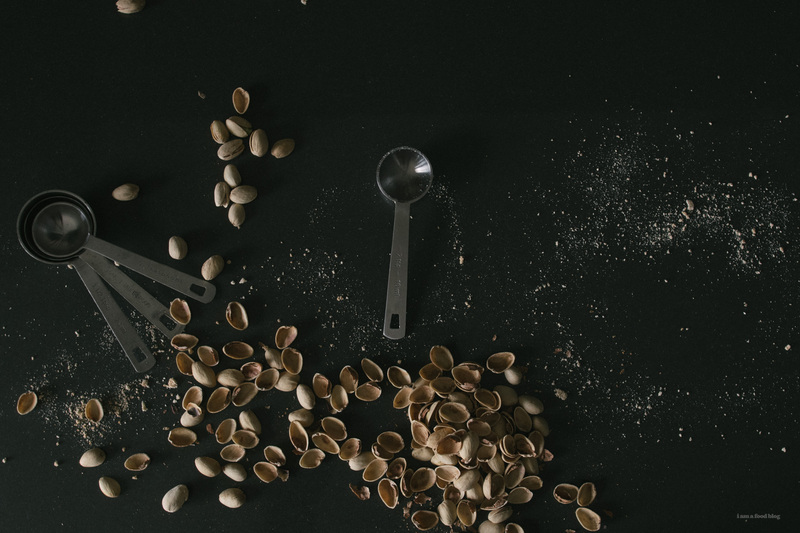 Remove the nuts from the oven and combine with the icing sugar and simple syrup in a blender or food processor. Pulse until fine. Preheat your oven to 340° F. Line four 4″ springform pans with parchment paper and butter. Sift almond powder and icing sugar together and set aside. 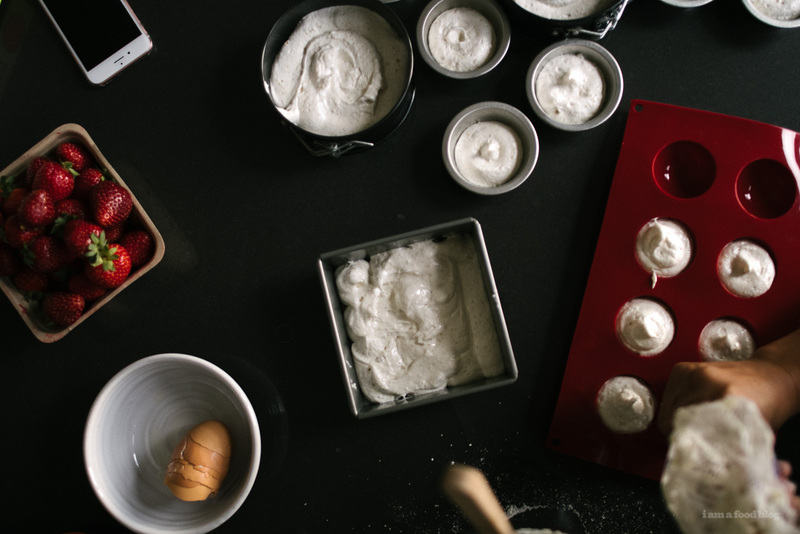 Whip the egg whites and granulated sugar until a meringue forms with stiff peaks. 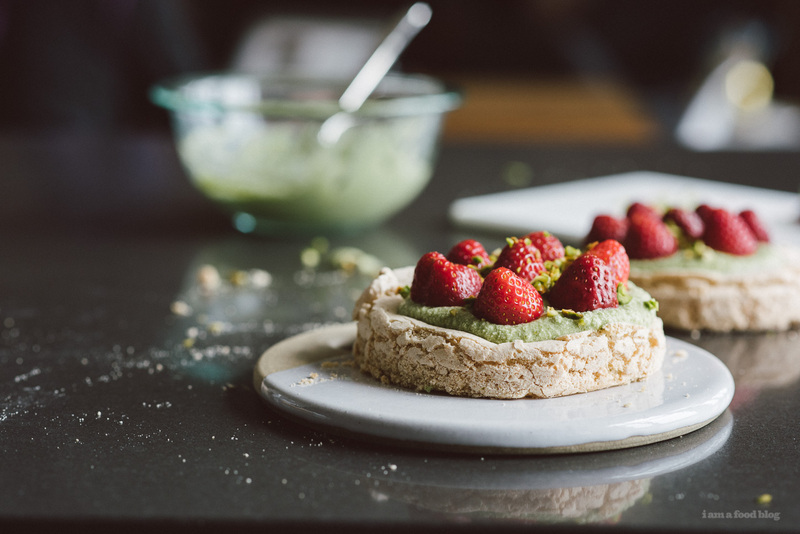 Remove 1/2 cup of meringue and fold the pistachio paste until evenly mixed, then add it back into the main meringue mixture. Fold the almond flour and icing sugar mixture into the meringue. Pour this mixture into a piping bag with about a 1/2″ tip. Pipe your mixture into the springforms and bake for 10 minutes. Once baked, let cool on wire racks and set aside. Combine water and sugar and bring to a boil. When the syrup starts boiling, start whisking the egg whites, preferably in a metal bowl. Once the syrup reaches 243° F slowly add it to the egg whites. 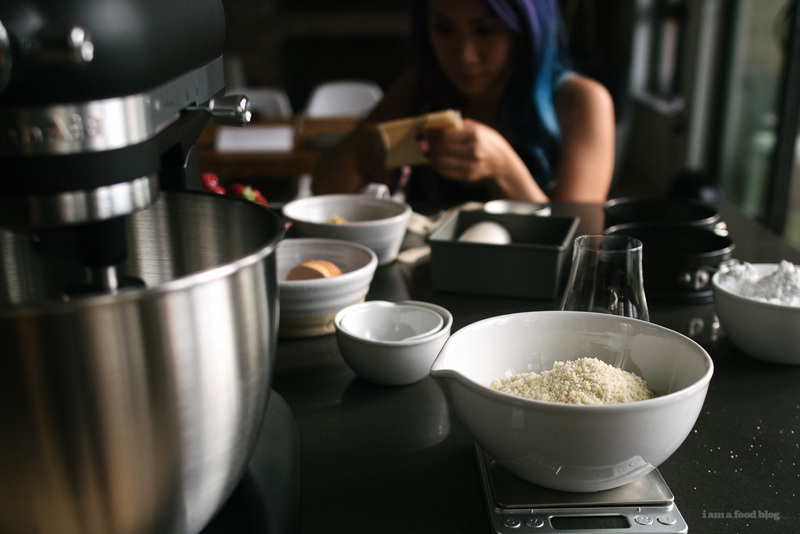 Continue whisking until the bowl feels cool to the touch. Microwave your milk until boiling (about 30 seconds in a 1000w microwave). Combine egg yolks and sugar in a saucepan. While stirring, pour the hot milk into your egg mixture. Over very low heat, bring your egg mixture to 180° F, stirring all the time. Be careful not to scramble the egg yolks. Once the mixture has reached 180° F, remove from heat and let cool. Beat in the butter. Fold the italian meringue in, and set aside. Microwave your milk until boiling (see above). Mix egg yolks, flour, corn starch, sugar, and vanilla in a large saucepan. While stirring, pour the milk into the egg mixture. Over very low heat, bring your egg mixture to 180° F, stirring all the time. Be careful not to scramble the egg yolks. Once the mixture has reached 180° F, remove from heat beat in the butter. Let cool and set aside. 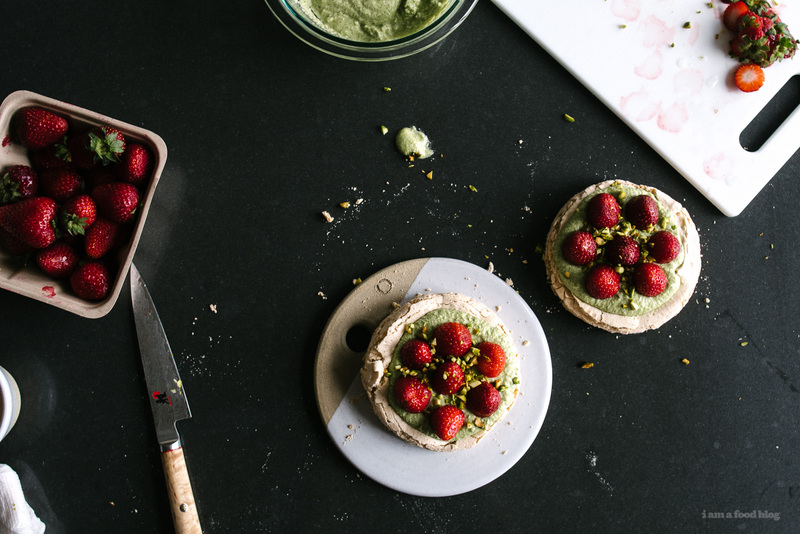 Combine buttercream, pastry cream, pistachio paste, and food coloring until smooth. Pour the mixture into a large piping bag. 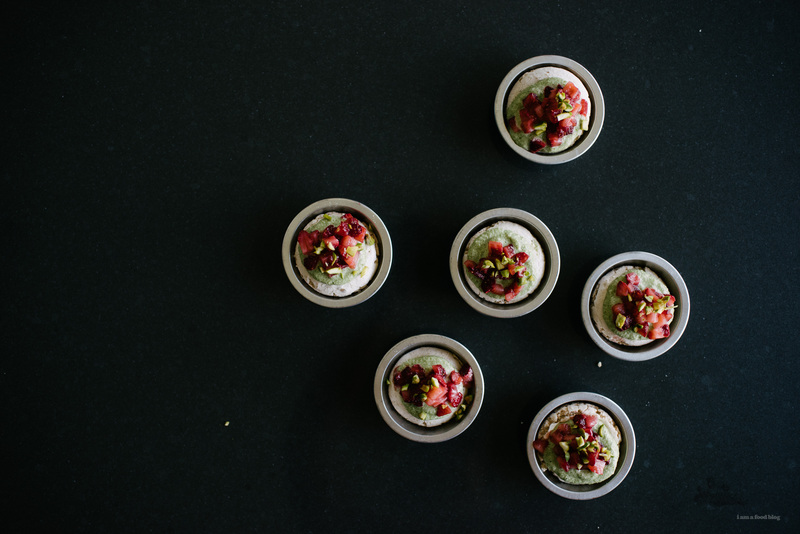 Pipe the crème mousseline over top of the pistachio dacquoise, then top with raspberries (if in season) or strawberry and chopped pistachios. This was a thoroughly enjoyable read. Now that everyone knows her dark secret, I’m sure there will be plenty of cake to be had! This was so lovely – a completely gorgeous blog post. As for your story, just always remember, it’s the thought that counts! blog about hot pot!!! it’s probably more interesting than you think (i bet a sizeable portion of your readership has never had hot pot!). Mike, you are a good man. Steph – Happy Birthday! Mike, you made me cry. You are the best ever! And Steph, Happy Birthday to my favourite blogger since forever. I love hotpot and am spoiled for choice where I live, but would love to know what goes into yours. You two are just fabulous! Happy birthday! What a cute post! I have no idea what hot pot is! You should certainly make a post about it. This is freaking ADORABLE. Mike, thanks for sharing, and sorry Steph, everyone knows now! Seriously, though, please blog about hot pot. My grandmother does da bin low for Christmas and New Year’s, but because I live on the wrong coast, I’ve only had it a few times, not enough to figure out its magic. I would LOVE to learn how to make it myself. This is seriously the cutest thing ever. I loved reading your past (failed) cake birthdays! Congrats on getting it right, this seems like the perfect way to make up past birthdays!! AMAZING BLOG POST!!!!!! Omg LOVED hearing about your history together. So so cute. Also, Steph, I totally share your dark secret. This year for my birthday, my friend had planned to make me the momofuku birthday cake to take to the bar where I was celebrating my birthday, but I was so sad about the idea of 1) letting everyone else eat the cake and 2) letting everyone else eat the cake in a dark, drunken haze instead of properly appreciating it that he just served the cake to an intimate pregame group and then made me a second cake for the bar. IT WAS THE BEST. Wishing you all the best cakes in life for your future birthdays!! And Mike, you are a GREAT writer (and impressive baker)!! Mike you are too, too cute! Please do a hot pot post! this is my favorite post ever on this blog. love learning about your quest of cakes and her deep (not-so-dark) secret. hope to see her dream fulfilled sometime down the road! Hot pot hot pot hot pot!!! Also, this post is the sweetest. Happy (very) belated birthday, Steph!